Just when it felt that March would last forever, it would appear that the Easter Holidays are upon us. 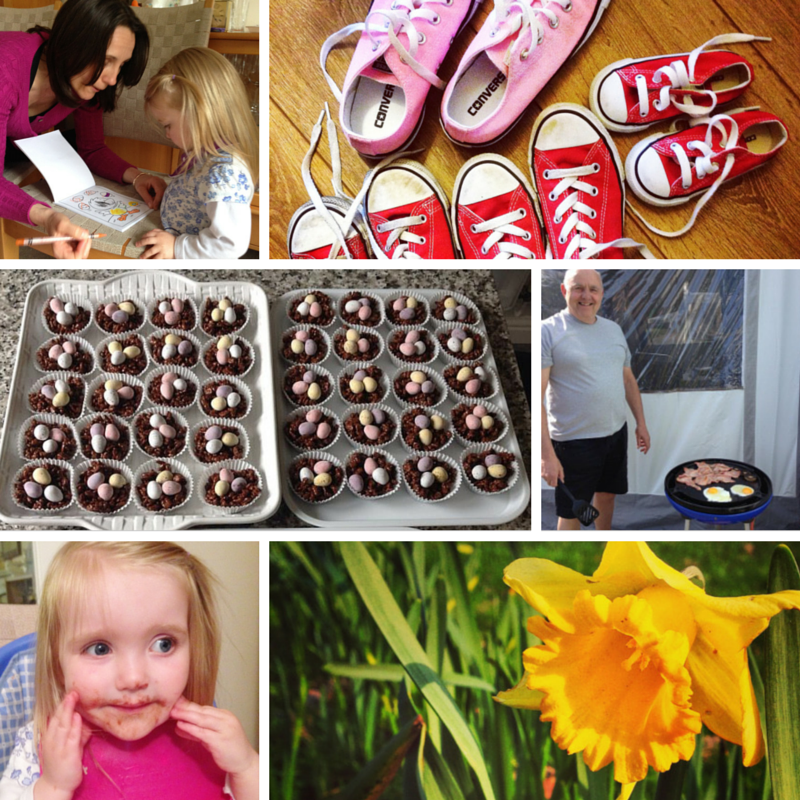 Easter means different things to different people, and for us there has been a tradition of getting together with family in Wales. We’ve spent the last four years going to Cardiff to visit my husband’s parents and to catch up with his sister, nieces and nephews. But this year for the first time we find ourselves at home in Maidenhead as his family are all in America (his sister has relocated and his parents are visiting them). So this year there will be no Bank Holiday M4 ‘negotiations’ or strategies, no surplus of meat from Grandad’s BBQ in the rain and sadly, none of ‘Nana’s nests’! And with our little lady finally able to eat dairy, and finally big enough to tackle a decent sized Easter egg she’ll miss the opportunity to race her cousins to see who can devour a chocolate bunny the fastest! So with a soon to be three year old, and four days at home as a family together I was keen to find out what was happening on our doorstep so I turned to the two ‘oracles’. I asked the ladies in Maidenhead Gossip Girls and Maidenhead Business Girls Facebook groups for the local lowdown about what was happening at Easter in Maidenhead. And there’s lots to report! 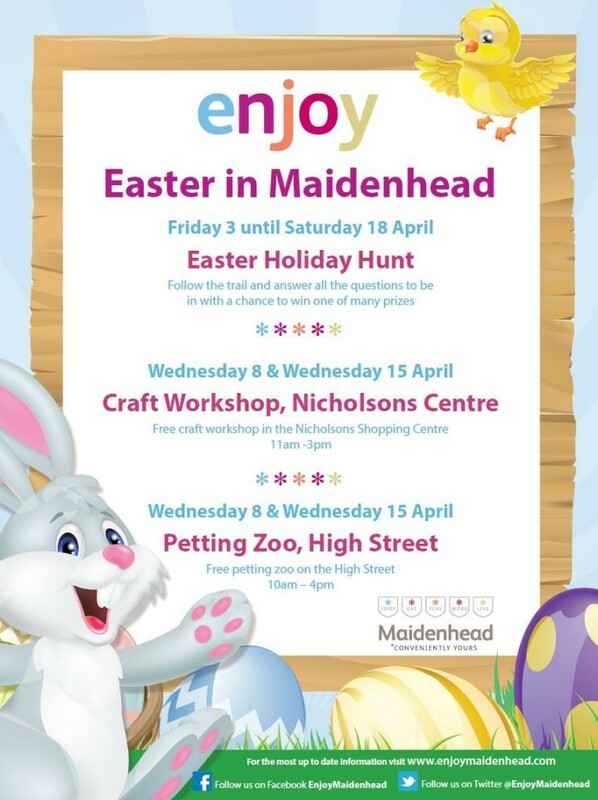 I’ll cover off the things happening over Easter weekend first and I was pleased to see that there are even some free activities happening. Starting on the 3rd April, and running for the next two weeks, you can take part in a treasure trail around the local shops answering questions from the entry form you can pick up from any of the 25 stores that are participating. Each store has donated a prize worth £25 so you’re in with a chance of winning something good. Plus with arrange of retailers taking part, both national companies like Three and local retailers like Wally’s Toy Shop, it’s a great way to support the community and to have a little look inside shops you might not normally venture into. You can collect your questionnaire from any of the stores participating or from the main square of the Nicholsons Centre. Click here to find out more. So once you’ve done your Easter trail around town you could also take a short walk up to Grenfell Park to join in their family fun day which is aimed at young families from babies up to 12 year olds. 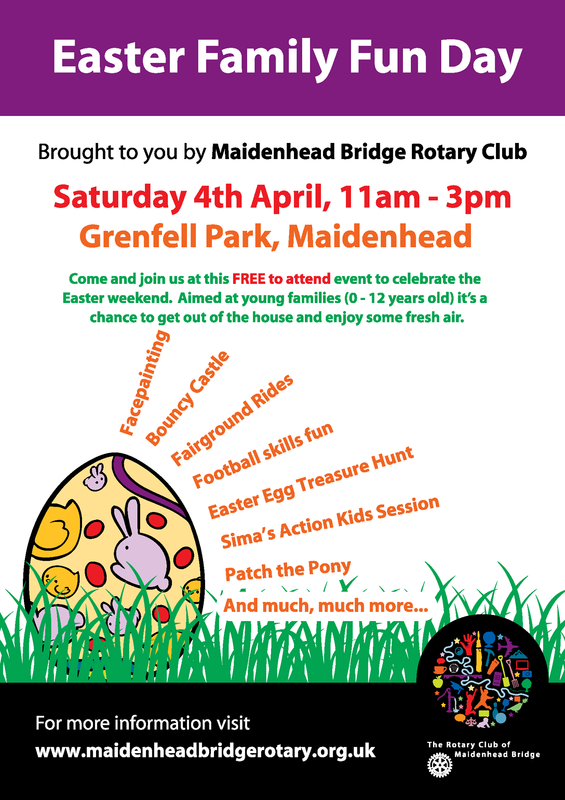 Organized by Maidenhead Bridge Rotary Club there will be facepainting, fairground rides a bouncy castle and a whole lot more. 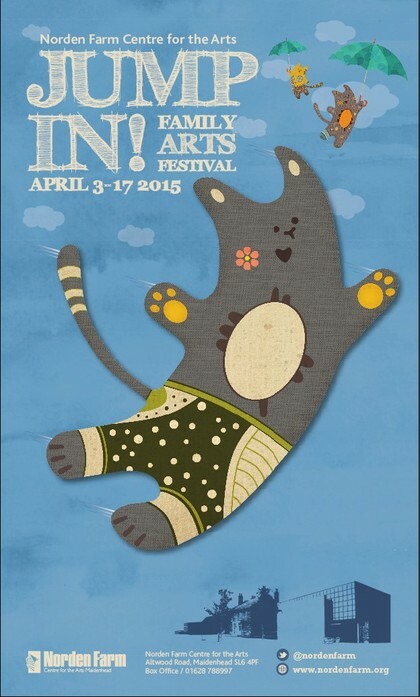 It runs from 11-3pm on Saturday and is also completely free! You can find out more on their Facebook page. Just a short drive along the A4 takes you to Stubbings Garden Centre and Nursery. From Friday through to Monday they have a free mini Easter egg trail within the Walled Garden. Once you’ve completed your quiz sheet you can claim an egg (one per child) from the café. Stubbings was one of our regular haunts with my NCT friends while we were on maternity leave so I can personally vouch for their delicious cakes! You can find out more on their website. Plus, if the weather isn’t too good (ha, it’s a British Bank holiday after all!) 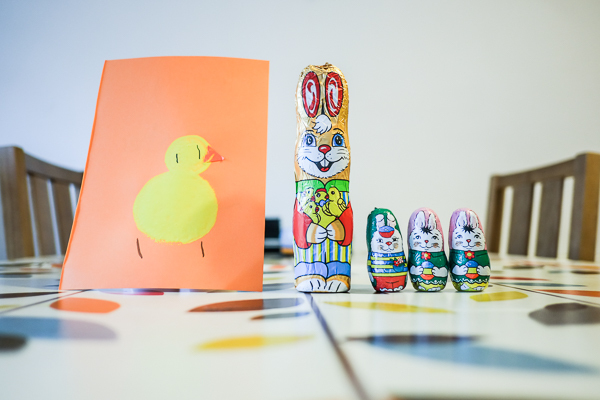 there is also an Easter Craft Workshop on the Friday, Saturday and Monday from 10-3, run by Mucky Monsters. Its £3 per child for the first craft and £2.50 after that with 5 to chose from. More information about the craft sessions can be found on the Mucky Monsters Facebook page. If you find that we’re blessed with glorious sunshine then a trip to Cliveden might be a great way to spend some family time together. With beautiful gardens and woodlands to walk around and admire, there is also plenty for the kids too with 500m of winding paths in the Maze and a ‘Storybook Den’ with wooden carvings of favorite story book characters. I have to admit that I feel a little guilty that we’ve never actually been to Cliveden, even though it’s just down the road. 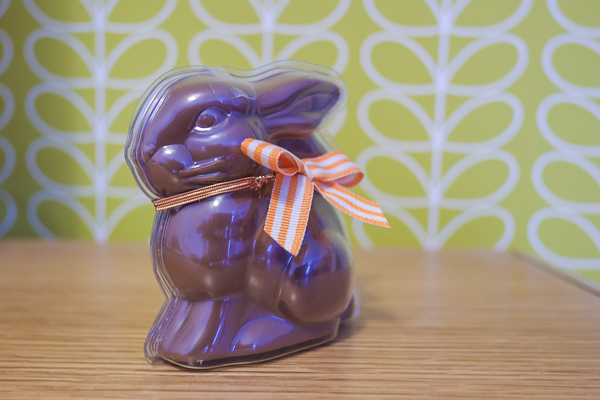 If you’re guilty of that too, then you’ll be pleased to hear that as an added bonus they have teamed up with Cadbury’s to create an Easter Egg Trail. Full details are on their website. 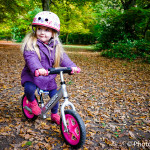 Whilst I’ll be back at work on Tuesday and the little one will be back at nursery, I know that lots of you will be figuring out how to keep the kids entertained over the next two weeks so I’ve done some digging to see what your options are. With a jam packed programme of events, Norden Farm have come up trumps this year. The activity kicks off on Good Friday with their ‘Give it a Go’ taster workshop day. There are lots of workshops to choose from ranging from circus skills to chocolate making and each workshop costs £3 for an hour or you can buy a pass which covers you for 4 workshops for £10. Courses are split into groups from 5-7, 8-10 and then 11+ and there are even two pre-school sessions starting at 9.30 and 10.45. I’ve seen the results of the chocolate making class on Instagram from another Maidenhead Mum and they look amazing! The festival continues over the two weeks of the holidays with family shows and films including Mrs McMoon’s Tea Party and a Frozen Singalong. There are 2 holiday clubs running and there are daily craft and storytelling sessions too. Boom! Go Norden Farm! You can find out more on their website. 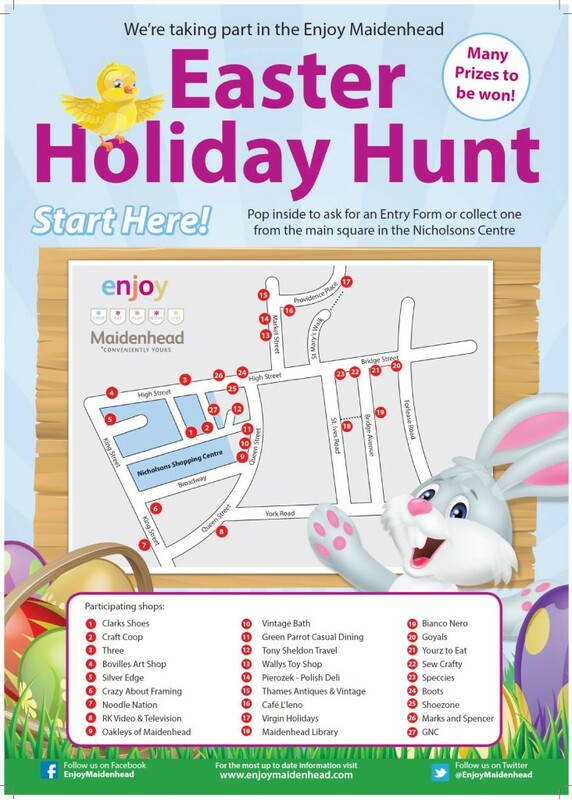 I’m guessing that ‘soft-play’ will probably feature at some point in your survival plan for the holidays and Jungle Mania at Woodley and Bourne End are having an Easter party on the 7th April. Tickets are £5 each for all ages and the party runs from 3.30 to 5.30. 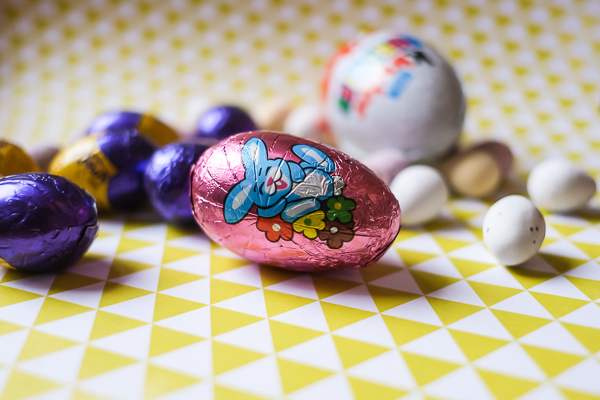 There will be games, prizes, an Easter egg hunt, an Easter biscuit decorating activity, fancy dress… oh and snacks are included! I’m almost jealous I’ll be stuck in the office! There’s more info on their Facebook page. Over the holidays they have a ‘George and the Dragon show, Circus Skills Workshops and Music and Dance for the under 5’s. This is addition to the ‘usual’ features: the play area and the animals… and not forgetting their tasty bacon sandwiches! There’s lots of info on their Facebook page. If you fancy your hand at helping the kids make Spring Bunting then swing by the Craft Coop in their new location (opposite Topshop) in town on the 11th. Check out their Facebook page for updates of other drop in activities for the kids. Now I have to admit that if my little one was a little older I would be VERY interested in sending her to learn how to bake a cake and I’m sure the idea of making an edible flower pot cake would appeal to her. I’ll be honest, at 2 and 11 months, it would very much appeal to her now, but I don’t think she’d be a welcome addition to the class. 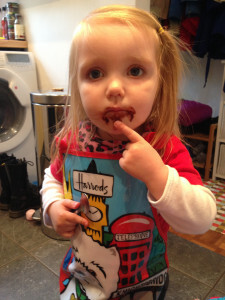 Her enthusiasm for ‘stirring and mixing’ far outweighs her accuracy of keeping anything in the bowl! ‘Cats Cooking School’ in Marlow is run by local mum Catherine and has a workshop on the 9th April running from 10.30-1pm for children aged 8 and over, cost £45. You can find out more on her website. Rabbits are for life, not just for Easter. Thanks for reading my post. 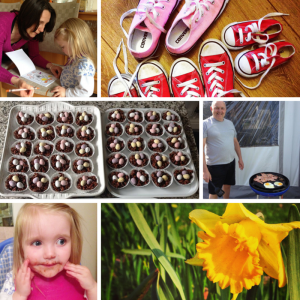 I use my Maidenhead Mum blog to talk about all things relevant to life in and around Maidenhead. 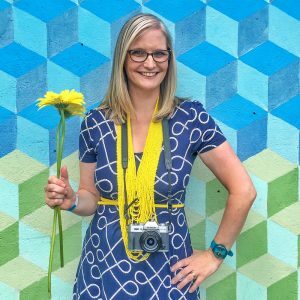 If this is the first time you’ve read my blog, you might like to subscribe by email to get posts delivered straight to your inbox, or if you pop over to ‘like’ my Facebook page you can keep updated that way too. And if you visit any of the places featured in this post, feel free to leave me a comment below with your thoughts and I’ll update the post with real feedback. 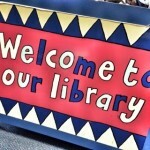 Encouraging the Bookworm Bug – joining the library.